The proliferation of cheap drones has given terrorists deadly new weapons, pranksters the tools to shut down major airports, and criminals the ability to scope out potential targets. In response, according to a new story by the Wall Street Journal, weapon makers ranging from Boeing to Lockheed Martin are working on new anti-drone technologies — and they include laser cannons and heat-seeking missiles. Drones are deeply destabilizing because they’re relatively cheap, opening up strange new frontiers in security and warfare. According to the WSJ, experts estimate that anti-drone weapons will top an alarming $1.2 billion in sales next year — and $1.5 billion by 2021. “Everyone is so preoccupied by this threat they are willing to give anything a try,” Arthur Holland Michel, the co-director of Bard College’s Center for the Study of the Drone, told the WSJ. Lockheed Martin is working on missiles to shoot down drones, according to the WSJ, and Boeing and a Chinese defense contractor are both developing laser cannons to blast them out of the sky. A company in Singapore is working on a handheld gun that jams drones’ radio signals to take them down, the WSJ reports, and Diehl Defence is building a system that uses high-energy electronic bursts to frizzle up drones’ circuits from a distance. 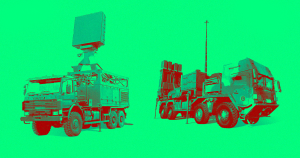 The post Military Contractors Are Churning out New Anti-Drone Weapons appeared first on Futurism.